It's September, and I for one and happy about that. August is always a crazy month, and this year was no exception, so welcome September, it's time to slow down! Listening: General Hospital is the soap opera I've watched since I was in high school, I've missed a lot here and there, but now I can stream it on my iPad whenever I want so I catch up in the evenings or on the weekends. Loving: I am so ready for this weekend. I am looking forward to some time to relax and finish some projects that I didn't manage to get done over the summer. I don't have much on my calendar for this weekend and that's rare, so I'm taking advantage of it! Thinking: My brain is just a little fried at the moment. Work has got me busy busy busy, and I love it but I'm exhausted. I really just want to do absolutely nothing, which is why I'm planning on getting cozy with a book as soon as I finish this post. Needing: Ugh, it's time to get back into my work out routine, I know it is, but I am so not looking forward to it. And that's all I have to say about it. 3 goals: #1 Yup, working out. My goal is three times a week - that's a manageable place to start. #2 We've been working on an addition to our house since May and it's almost done, but I have a few projects left to finish and I am going to get them done by the end of the month. #3 When I'm not working I'm stressing out about all of the work I need to get done at home, I really need to take some time to enjoy myself. What have you been up to? 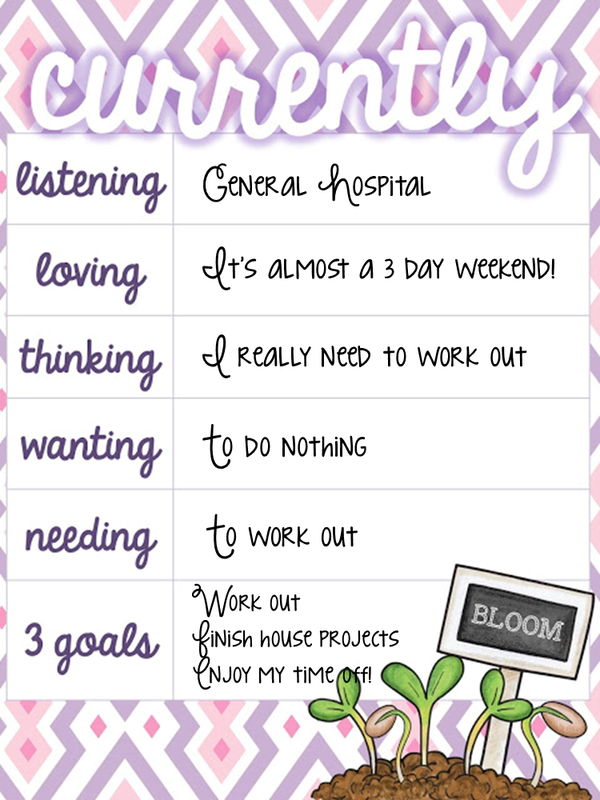 I'm linking up with Farley at Oh Boy 4th Grade for this month's currently, check out her blog to see what other teacher-bloggers are up to this month! I know! I am ready for the weekend too. I also have some projects that need my attention. It's only the first week of school but I am completely looking forward to the 3 day weekend! Bring. It. On!